Title: DIRECTION ET LA CONSOLATION DES PERSONNES MARIEES, ou Les moyens infaillibles de faire un Mariage heureux, d’un qui seroit malheureux. Avec l’abrege des vies de quelques saincts & de quelques sainctes, qui ont beaucoup souffert dans leurs mariages. Description: Paris, Claude Calleville 1664 . 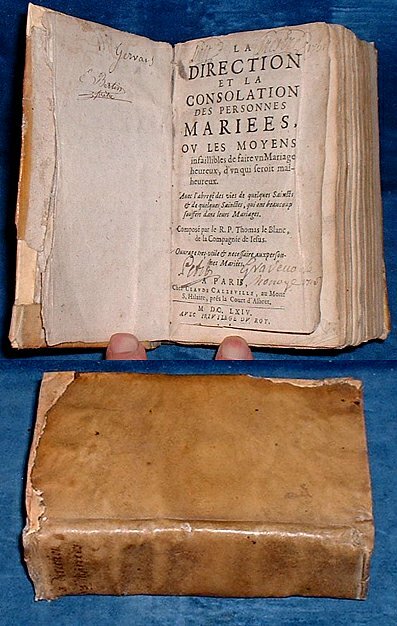 Duodecimo original vellum (repaired at edges) Titlepage with approbation on back +pp to reader +pp contents +652pp. Title page with two faint ownerships dated 1706 and 1761 fly leaf with E.Bertin (pretre) and also Gervais. About a dozen pages with marginal worm track disappearing into a single marginal hole, one marginal tear without loss and the last page with small cut corner no loss to printed area. *A practical marriage guide laid out in short pity advice and interspersed with short stories from examples including historical unhappy marriages of saints. The author seems to have been slightly unusual in Jesuit circles in having also written another practical book advising that buckling down to work with your hands is also a way to salvation.